Heavy embroidered wine maroon bridal wedding lehengaLehenga Colour: Wine Maroon. Blouse Colour: Wine Maroon. Dupatta Colour: Peach. 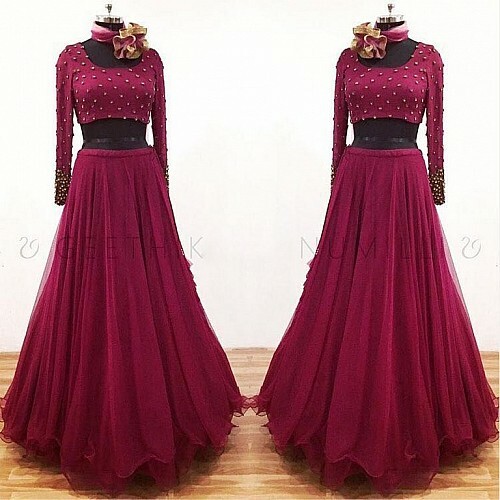 Lehenga Fabric:..
Wine maroon heavy tapeta silk partywear anarkali suit Fabric : Heavy tapeta silk gown with 4+ meter flair ( inner attach) Length 57+Ge..
white banglori silk dori and pearl work lehengaFabric : Banglori silk lehnga with 3.15 meter flair Waist upto 44+Banglori silk blouse..
Wine maroon malai satin heavy emboirdered brial lehengaPRODUCT FABRIC DETAILSLehenga Color: Wine. Blouse Color: Wine. Dupatta Color: Peach. .. Fabric :Georget lehnga with 3 meter flair soft Tapeta silk blouse with embroidery work nylon net duppata with heavy Zari & thread w.. Fabric :Net lehnga with embroidery work ( semistitched )Inner : Satin silkNet duppata Matti shining blouse ( unstitched ).. Fabric :digital satin Banglori print lehnga with 4.25+ meter flairBanglori silk blouse ( unstitch )net duppata..
Yellow banglori silk plain partywear lehengaOccasion : Party Work : Zari & SequinsLehenga :Fabric : Banglori Silk Size&nbs..
Grey crepe gorgeous pearl hand work partywear lehenga with dupattaOccasion : Party, Sangeet, Festive Work : Pearl hand workLehenga : F..